USA KEYTAGS - OLYMPIC SPECIAL! 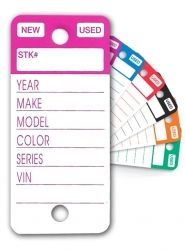 Imprinted with "PROUD TO BE AN AMERICAN"
This smooth finish tag comes in six attractive color combinations that are especially handy when color coding keys for new cars, used cars, fleet cars, and multi-franchises. Each box of 250 Top Stripe Key Tags comes with 250 steel rings and one "Fine Point Sharpie" pen. 20 mil. thick, rigid calendered vinyl. Great surface for writing on.